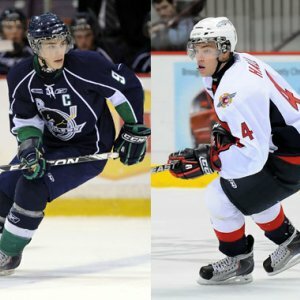 The OHL looks like they are going to be producing a majority of this years first round prospects in the NHL Entry Draft. The top ten in the Central Scouting midterm rankings consist of six players from the OHL: 1. Taylor Hall, 2. Tyler Seguin, 3. Cam Fowler, 6. Erik Gudbranson, 7. Alexander Burmistrov, 10. John McFarland. But the real debate is who is number one between Hall and Seguin. Tyler Seguin of the Plymouth Whalers (Left) and Taylor Hall of the Windsor Spitfires (Right) are projected to be the top two picks in the 2010 NHL Entry Draft. Central Scouting had Seguin ahead of Hall for the number one spot in the preliminary rankings at the beginning of the season. When the midterm rankings came out, Hall had moved back to number one. Last fall scouts thought Hall was a lock to go first overall in the 2010 draft. With the emergence of Seguin, scouts are now unclear on who will go number one. It’s the closest E.J. McGuire has seen the race for the top spot be since 2006, when Erik Johnson, Jordan Staal, Jonathan Toews, Nicklas Backstrom and Phil Kessel were top prospects. All five of them were picked in that particular order starting from number one. Hall however, has an advantage over Seguin. He has a more impressive resume. Hall represented Canada in the 2010 World Junior Championship in Saskatchewan. He had 12 points in 6 games and was named to the tournament all-star team by coaches. Canada fell short of the gold medal, and lost to the Americans in overtime and placed second. Hall is also in his third year in the OHL. He also has led his team in a deep playoff run and been to the Memorial Cup. Seguin however is currently leading the OHL in points and has more goals (37) and assists (49) than Hall, who is right behind him with 34 goals and 49 assists in 46 games. He is playing only his second year in the league but has put up the same numbers as Hall. There is no question that he will surpass Hall’s second year numbers (90 points in 63 games), as he already has 86 in 49 games. The fact that he is a year younger than Hall may attract scouts. Seguin has less skill around him on the Plymouth Whalers, while Hall has a highly skilled Windsor Spitfires team to support him. This debate has been going on all season and people have picked their sides but there is still no clear number one. It is all going to be based on what the team with the number one overall pick needs. Seguin is a center and Hall is a winger. “We’re splitting hairs,” Central Scouting Director E.J. McGuire told NHL.com. “What does a team need? That’s how close it is. Does a team need a right-shot center (Seguin)? There’s your answer. Does a team need a speedy left wing (Hall)? There’s your answer. In my opinion I believe that this has similarities to the Ovechkin and Crosby debate. Ovechkin is Hall and Crosby is Seguin. Hall is the more flashy player and is going to be the one making big plays and standing out. Seguin is going to be the one with a better hockey sense and be more help to his team. Basing my opinion off or what have seen and heard about Hall, he will make a bigger impact right away for an NHL club. He has more experience and is older, meaning that he is more ready to make the jump than Seguin. Hall has better hands in tight corner and is considered to be more physical. Both players are really fast but Hall has the upper edge when it comes to straight line speed. Seguin however, makes things happen and has better hands at top speed. Not that Hall cannot do those things, Seguin just has the upper hand. Seguin is also considered the smarter player. My position depends on the question. If it is who is going to make an impact to the team drafting one of them right away, Hall is the answer because of experience and has superstar potential. If a team was looking for a player to help them in the long run Seguin would be the better player because his skill level and hockey sense is going to help his team out more. Both of these players will be successful but in the end I believe Hall will stand out more and Seguin will be the overall better player. Hall will be more of a fan favorite. If I were an NHL general manager I would pick Seguin. Still Hall is a very intriguing prospect and no one knows for sure who will be better at the next level. The skill level of the two have put them above all the other prospects in the upcoming draft. Opinions can only be evaluated by what they have accomplished so far in their careers and the jump to the NHL is a big step. They are in fact two different people and players and are going to bring something different to the table. Analyzing how they present themselves off the ice might be another factor on their draft stock that no one has really looked at yet. Who would you take with the number one pick? This entry was posted in Hockey and tagged 2010, central scouting, central scouting rankings, draft, drafted, entry draft, hall, Hockey, midterm, NHL, NHL entry draft, number one overall, number one pick, ohl, ontario, ontario hockey league, plymouth, plymouth whalers, preliminary, prospects, ranking, seguin, spitfires, taylor, taylor hall, tyler, tyler seguin, whalers, windsor, windsor spitfires. Bookmark the permalink. I would pick Hall. I think a flashy player would bring more press to a team, which is the ultimate goal. It depends on what view point an individual has because a flashy player who is more popular amongst fans will draw in more revenue for the team. While a player with more hockey sense may be better for a boost in team morale, I hate to say it, but isn’t money the most important aspect in this industry?